I've long been a fan of using cartoons and comics in education. My love of comics began in my early teens I think, when I read Superman, Batman, Spider-man and Archie comics. (My mother's continual wail, when I was clearly not listening to a word she was saying, was "Terry's always got his head in a comic!"). I also read serious stuff too. There was a series of comics called Classics Illustrated, that were essentially graphic (and shortened) versions of great works of literature. What I liked about comics was the juxtaposition of words and pictures, and the way they interacted with each other. When I started teaching, I used cartoons and comic strips in a variety of ways. Here are some suggestions based on my experience. The trouble with putting posters up in the classroom is that nobody takes any notice of them unless you explicitly draw kids' attention to them. I found, though, that using posters to illustrate, in a humorous way, the dangers of things like leaving your log-in details lying around, or not saving your work frequently, did get the point across effectively, and in a friendly manner. Lost your work again? Use AutoSave in future! A selection of pages from the network manual. Incidentally, I told one class that the female face on the Contents page was actually a portrait of my wife. There was absolute silence for several seconds, then a voice from the back piped up: "Your wife is well ugly, Sir."! The cartoon drew some smiles from the class, and made them want to read the handout. But it's also worth looking at the titles of the books my cartoon self is carrying out of the library, because they illustrate another way of using comics and cartoons. See the next heading for details. You could use that cartoon as a basis for discussion in your lessons: what does the cartoon refer to, what actually happened, how could it have been avoided, and so on. In the previous section I referred to the titles of the books I drew. Here's what they referred to, and why they would have been great starting points for discussion. "The £ in your pocket". This refers to Harold Wilson's statement on devaluing the £ in 1967: "This won't affect the pound in your pocket." Devaluation is when you lower the value of a currency in relation to other currencies, so how could Wilson's statement have been true? And if it were true, under what circumstances would that be the case, and what would be the point of devaluing in the first place? "Getting the job you want, by Norman Tebbit". Tebbit famously said that when his father was unemployed in the 1930s, he got on his bike and went everywhere looking for work. That was interpreted as "Stop moaning and get on your bike". Lots to discuss here, such as: is telling people to get on a bike and look for work the answer to structural or other changes to the economy? What is the underlying assumption there about how the economy works? How does it relate to the economic philosophy known as monetarism? "Monetarism rules OK, by Maggie". Margaret Thatcher was a confirmed monetarist. Why did she think that worked better than the alternative, and what was that alternative? Who was the most famous economist she was influenced by? We tend to think in terms of verbal explanations, or fall back on videos. But drawing a comic strip to illustrate something can be a great teaching device. See the video below too. Getting the kids to show what they've learnt and understood by creating a comic strip can be a great way of helping them consolidate their knowledge, demonstrate what they know, and have great fun while doing so. You don't have to be good at drawing to create cartoons and comics, as I think my own examples amply demonstrate (although I'm expecting to be contacted by the Tate Gallery any time now). However, they (or you) don't even have to be good at drawing because there are some great tools available to help you do it. See 20 great tools for making comics and cartoons for teaching and learning. See also my review of Comic Strip Creator. 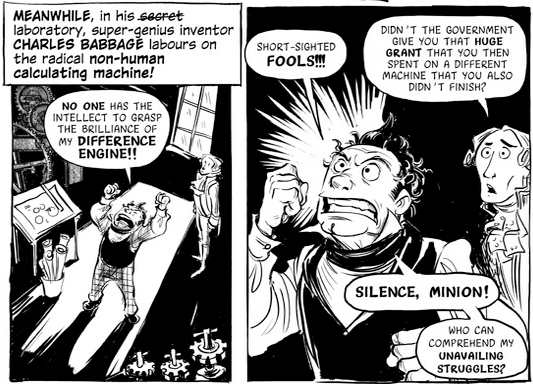 I've read a few books about Ada Lovelace and her role in the development of computers and computer programming, but by far the most engaging is The Thrilling Adventures of Lovelace and Babbage. I've mentioned some of these ideas and resources before, most notably in my Digital Education newsletter, in which I ran a competition to win a hard copy of the Lovelace and Babbage book. This post was inspired by a talk by Gene Luen Yang, a comics book illustrator and creator who used to be a teacher of Computer Science. Here's the video of his talk. Enjoy!